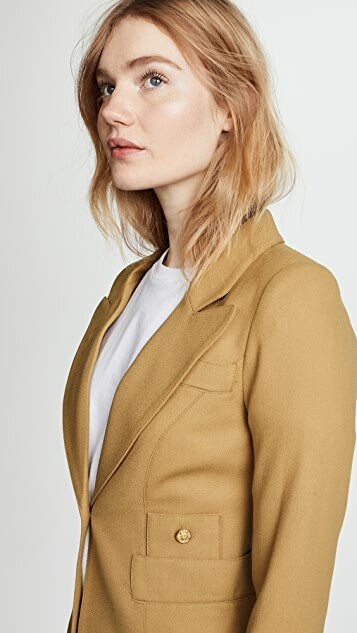 A tailored SMYTHE blazer, styled with exaggerated peak lapels and a notched back vent. Single-button placket. 4 pockets. Lined. After reading some reviews I decide to take size 6 US ( I'am 4 US ) but is also small, I'am sending back for an 8. I think maybe go for UK sizing... this is not US sizing. Beautiful and great quality if you find your size. There seems to be some debate about fit on this item, so maybe I can help elucidate for those considering. First of all, it is stunning. the camel color is much , much richer than it appears on your monitor. 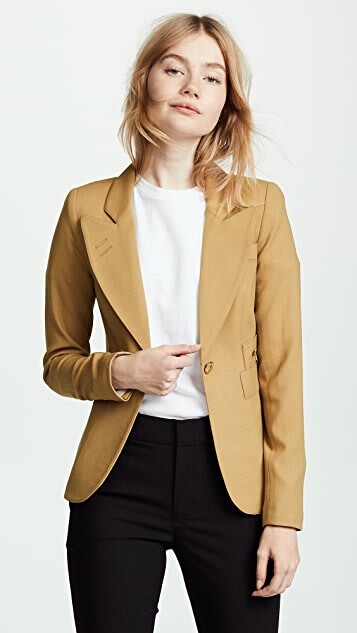 Gold buttons are totally luxe. It fits me perfectly. 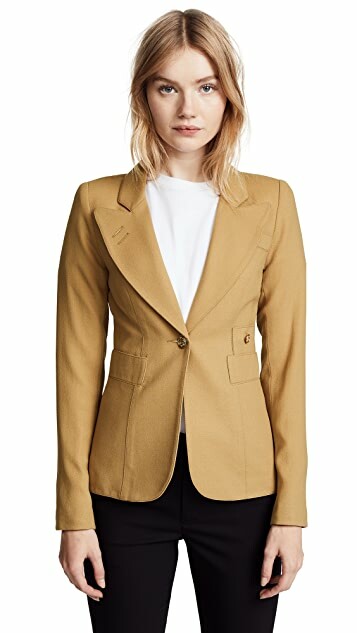 I had hesitations about paying this much for a blazer (normally I'm a J Crew sale kind of girl), but the cut in the back really intrigued me. For my body type, it was as flattering as anything I've ever worn in my life. I am 5'4", 105 lbs, it is hard to say a size. I wear 0 or 2 from Jcrew. I think 34c/d..I am lazy and buy stretch bras, sorry. Often I need to shop in junior stores for jeans. I am short waisted, but not petite. So, although I can u/s the complaints about "long arms" on this jacket, it works perfectly for me in size 4. Remember Canadian sizes are totally different from US or Euro. If you are long waisted, or truly petite, this might not be the style for you. It is worth a try because the style is a showstopper.